This season you can save by indulging in activities that don’t cost a lot and making gifts for others yourself. To make the season even more special, involve the whole family in the preparations. You can always come over all noble and tell your kids Christmas is about love, not presents – but it’s not going to make you very popular. Or you can explain you’re a little short of cash this year and they can all help to make the celebrations more pleasant. This will teach them from a young age money doesn’t grow on trees, Mommy and Daddy’s wallets aren’t bottomless and there is such a thing as budgeting. Here’s how you can go about helping each other. Make it an adventure to make gifts for each other. 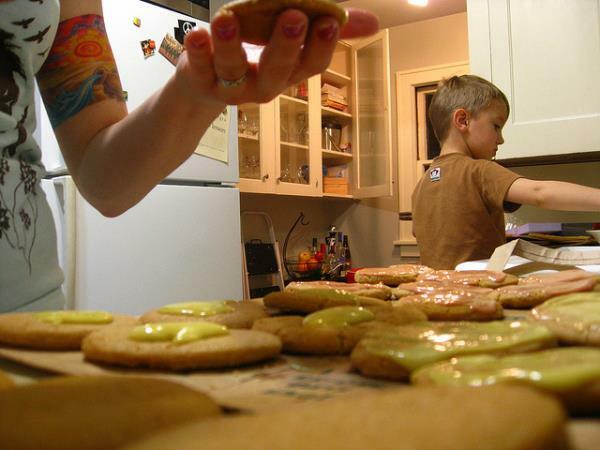 For instance, a child could help bake cookies in the kitchen and pack them in pretty packets or boxes. Take it a step further and get them to make a few extra packets and deliver them to the local old-age home. Get them to make their own gift wrap by potato printing or painting newspaper in rainbow colours. Save money by holidaying at home and going on little excursions that don’t cost anything. Make it an adventure by walking to the local park and having a picnic there. Watch the newspapers for free activities in shopping centres. Pretend you’re eating in your favourite grill restaurant by making menus and getting one of the kids to act as a waitron while you make the burgers in the kitchen. Homemade hamburgers are much tastier and cheaper than bought ones, and so are potato wedges cooked in the oven instead of oily chips. If you make spaghetti bolognese, stretch one packet of mince by adding baked beans and a tin of tomatoes. Make ice-cold milkshakes with ice cream given extra zing with finely chopped fruit. Freeze ready-made cooldrink to give them something cool to eat with a teaspoon.